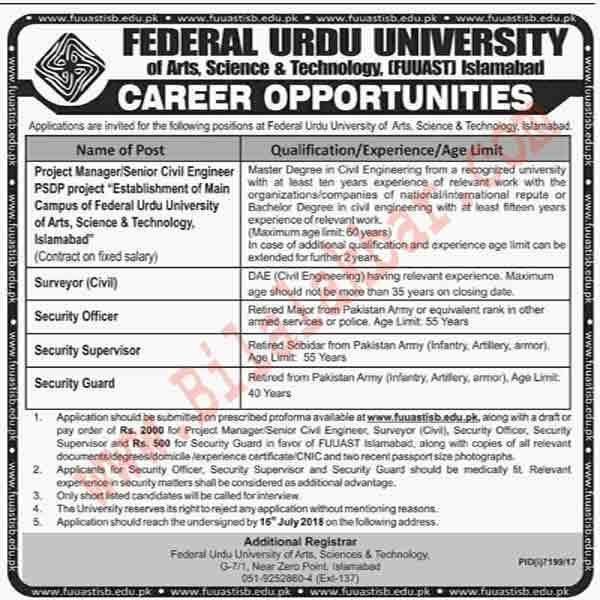 Applications are invited for the following positions at Federal Urdu University of Arts, Science & Technology, Islamabad. In case of additional qualification and experience age limit can be extended for further 2 years. DAE (Civil Engineering) having relevant experience. Maximum age should not be more than 35 years on closing date. Retired from Pakistan Army (Infantry, Artillery, armor), Age Limit:40 Years. The application should be submitted on prescribed proforma available at www.fuuastisb.edu.pk, along with a draft or pay order of Rs. 2000 for Project Manager/Senior Civil Engineer, Surveyor (Civil), Security Officer, Security Supervisor and Rs. 500 for Security Guard in favor of FUUAST Islamabad, along with copies of all relevant documents/degrees/domicile /experience certificate/CN IC and two recent passport size photographs. Applicants for Security Officer, Security Supervisor, and Security Guard should be medically fit. Relevant experience in security matters shall be considered as an additional advantage. The University reserves its right to reject any application without mentioning reasons. The application should reach the undersigned by 16"' July 2018 on the following address.